For years the message was that in order to lose weight, you had to eat a low-fat diet.Research has found however, that all fats are not created equal, and some are actually good for you.The key is to know the difference. Fats that cause high cholesterol, weight gain and other health problems are considered bad fats and should still be avoided, while good fats help protect your heart and your overall health and should be included in a healthy diet.Replacing bad fats with good fats should be your goal. Fats come from both plant and animal sources and fall into one of four categories: saturated fat, mono-unsaturated fat, poly-unsaturated fat (Omega-3s) and trans fat.Each gram of fat, regardless of the type, contains 9 calories. However, the effect on your health differ greatly between the different types of fat. Examples of healthy fats (which include both mono-unsaturated and poly-unsaturated fats) are fish, avocados, nuts, seeds, flaxseed, olive oil, green leafy vegetables, beans and some eggs (marked as high in Omega-3 on the label).All of these healthy fats can help lower cholesterol and lead to a healthy heart. Omega-3s, a type of poly-unsaturated fat, also plays a part in cognitive and emotional health, healthy joints and healthy pregnancies. In order to up your healthy fat intake, make nuts and olives your go to snack, use olive oil as oil of choice for cooking and for making salad dressings, and include fish in your weekly menu. Trans fats are considered the most dangerous form of fat for our health and should be avoided.They are found in manufactured food products and are formed by the process that helps preserve the shelf life of food. This includes packaged foods, solid fats, snacks and chips, and fried foods. Think twice before putting these items in your shopping cart. There are dissenting opinions on the effect of saturated fats on our health. Some researchers and health organizations believe saturated fats are unhealthy and lead to high cholesterol, heart attack, strokes and diabetes, much like trans fats do.However, others believe the source of the saturated fat dictates its effect on our health: saturated fat from pizza, fried foods and processed meats is thought to be bad, but the saturated fats found in coconut oil, salmon and dairy products, is not considered by some to be bad for us. Complicating things further, there seems to be a genetic component to how our bodies process the saturated fats, meaning what is bad for one, is not necessarily bad for all. To play it safe, most health professionals advise you limit the amount of saturated fats in your diet. 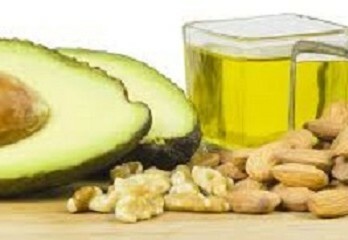 It is not necessary to avoid all fats in your diet. However, now that you know the difference between the good and bad fats, swapping out the bad fats for more good fats is a healthy decision!